For other people named Lord Carteret, see Baron Carteret. On 17 October 1710 Carteret married Lady Frances Worsley at Longleat House. She was the granddaughter of the first Viscount Weymouth. One of their daughters, Georgiana Caroline Carteret Spencer, became the grandmother of Georgiana, Duchess of Devonshire. On 18 October 1744 Carteret became 2nd Earl Granville on the death of his mother. His first wife Lady Frances Worsley died on 20 June 1743 at Hanover, and in April 1744 he married Lady Sophia Fermor, a daughter of Thomas Fermor, 1st Earl of Pomfret, a fashionable beauty and "reigning toast" of London society, who was younger than his daughters. Granville's ostentatious performance of the part of lover was ridiculed by Horace Walpole as "The nuptials of our great Quixote and the fair Sophia"  and "My lord stayed with her there till four in the morning. They are all fondness—walk together, and stop every five steps to kiss." George Carteret, born 14 February 1716, baptised 11 March 1716 at St Martin in the Fields, Westminster, eldest son who predeceased his father. 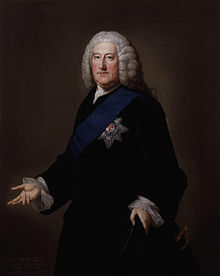 Robert Carteret, 3rd Earl Granville (1721–1776), born 21 September 1721, baptised 17 October 1721 at St Martin in the Fields, Westminster, eldest surviving son and heir. Louisa Carteret (c. 1712–1736) who married Thomas Thynne, 2nd Viscount Weymouth of Longleat in Wiltshire, and was the ancestress of the Marquesses of Bath (created 1789) and Barons Carteret (of the second creation 1784). Grace Carteret (born 8 July 1713, baptised 22 July 1713 at St James, Westminster), who married Lionel Tollemache, 4th Earl of Dysart, and had issue. Frances Carteret (born 6 April 1718, baptised 1 May 1718 at St Martin in the Fields, Westminster). Sophia Carteret, who married William Petty, 1st Marquess of Lansdowne, and had issue. "However, in the course of that active period, the duties of my situation engaged me in an occasional attendance upon a nobleman, who, while he presided at his Majesty’s councils, reserved some moments for literary amusement. His Lordship was very partial to this subject; and I seldom had the honour of receiving his commands on business, that he did not lead the conversation to Greece and Homer. Being directed to wait upon his Lordship, a few days before he died, with the preliminary articles of the Treaty of Paris, I found him so languid, that I proposed postponing my business for another time: but he insisted that I should stay, saying, it could not prolong his life, to neglect his duty; and repeating the following passage, out of Sarpedon’s speech, he dwelled with particular emphasis on the third line, which recalled to his mind the distinguishing part, he had taken in public affairs. His Lordship repeated the last word several times with a calm and determinate resignation: and after a serious pause of some minutes, he desired to hear the Treaty read; to which he listened with great attention: and recovered spirits enough to declare the approbation of a dying Statesman (I use his own words) on the most glorious War, and most honourable Peace, this nation ever saw." He died in his house in Arlington Street, London, on 2 January 1763. His remains were interred at Westminster Abbey. Two North Carolina counties were named for Lord Carteret, Carteret County (established 1722) and Granville County (1746). During the 17th and 18th centuries, the area which is now South Carolina used the names Carteret and Granville for a few of its counties. ^ "Carteret, John (1690–1763)" . Dictionary of National Biography. London: Smith, Elder & Co. 1885–1900. ^ G.E. Cokayne; with Vicary Gibbs, H.A. Doubleday, Geoffrey H. White, Duncan Warrand and Lord Howard de Walden, editors. The Complete Peerage of England, Scotland, Ireland, Great Britain and the United Kingdom, Extant, Extinct or Dormant, new ed., 13 volumes in 14 (1910–1959; reprint in 6 volumes, Gloucester, UK: Alan Sutton Publishing, 2000), volume XII/1, p. 153. ^ a b Chisholm 1911, p. 362. ^ Chisholm 1911, pp. 362-363. ^ a b c d e f g h i j k l Chisholm 1911, p. 363. ^ Rachel Wilson, ‘The Vicereines of Ireland and the Transformation of the Dublin Court, c. 1703–1737’ in The Court Historian, xix, no. 1 (2014). ^ "Homer, Iliad, Book 12, line 277". www.perseus.tufts.edu. Retrieved 22 June 2018. ^ "In the Iliad, what is the meaning of 'or glory give'? – Quora". www.quora.com. Retrieved 22 June 2018. ^ Wood, Robert (1769). An Essay on the Original Genius and Writings of Homer. https://archive.org/details/essayonoriginalg00wood. pp. To the reader, vii. This article incorporates text from a publication now in the public domain: Chisholm, Hugh, ed. (1911). "Carteret, John, 2nd Earl Granville" . Encyclopædia Britannica. 12 (11th ed.). Cambridge University Press. pp. 362–363. Nichols, R.H. and F A. Wray, The History of the Foundling Hospital (London: Oxford University Press, 1935). Wilkes, John William. A Whig in power: the political career of Henry Pelham (Northwestern University Press, 1964). Williams, Basil. The Whig Supremacy: 1714–1760 (2nd ed. 1962). "Archival material relating to John Carteret, 2nd Earl Granville". UK National Archives.